I have had many requests from my previous grain-free granola bars to make a nut-free version. 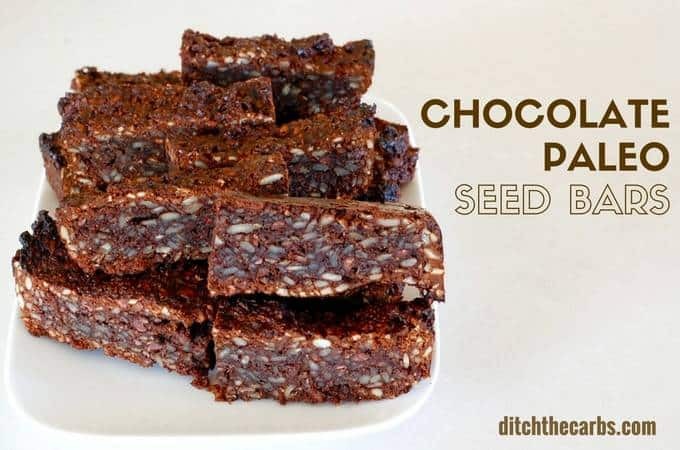 I have managed to develop chocolate paleo seed bars. 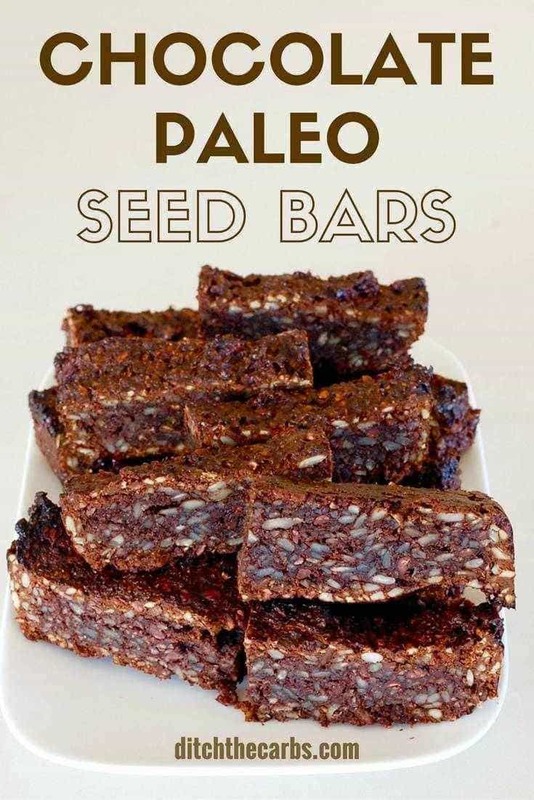 They are so incredibly filling, even half a paleo seed bar would probably be enough for a quick snack. So many readers are asking for nut free recipes. Both for those who have nut allergies and for those (like me) whose children attend a nut-free school. So much low-carb baking uses a variety of nuts, so I am slowly trying to develop more nut free recipes. 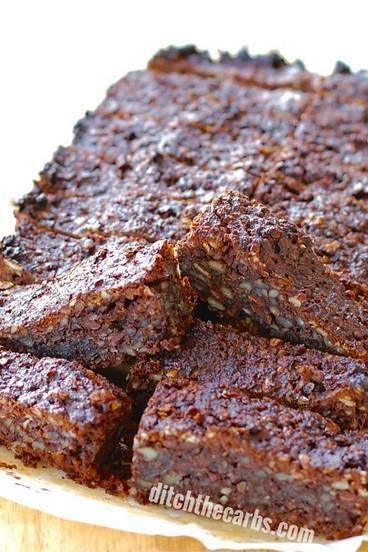 Chocolate paleo seed bars is easily adapted to whatever seed that you like, or can tolerate. They can be dressed up with a drizzle of melted chocolate too, for those kids who need a little more encouragement to give up their favourite sugar laden muesli bar. 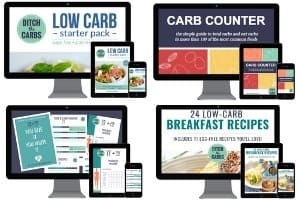 If you are new here and are wondering what all the fuss is about grains (and aren’t whole grains supposed to be healthy) then this page is a must read. I explain why modern grains are not what our ancestors ate, and were never found in almost every single product, meal and snack. By giving up grains, you immediately avoid the majority of processed junk food. Grains are used to fatten animals before slaughter and produce fatty liver disease in duck and geese, to make foie gras. No wonder al those whole grains are making us fatter and sicker. And as for the added sugar and processed oils … You may also want to read my FAQ where all of these are discussed. Blitz them long enough in the blender until you can see it all clumping together. Press the seed bar mixture firmly into the lined baking dish. This helps them form sturdy seed bars, rather than crumbly bars that fall apart in the lunch box. As the seed bars cook, sometimes the oil appears to come out, but don’t worry, it soaks right back in as the seed bars cool. Chocolate paleo seed bars are an incredibly nutritious snack for school, work or when you are out an about. Vary the seeds to whatever you prefer. Remember to pack the mixture firmly before baking to make sure they are sturdy. Place the seeds, linseed and eggs in the food processor with the blade attachment. Pulse until the seeds are roughly chopped and mixed with the eggs. Place all the other ingredients in the food processor bowl and pulse until thoroughly mixed and starting to clump together. Pour the seed bar mix into a baking dish lined with baking parchment (mine was 17cmx25cm, 7inchx10inch internal measurements). Press firmly into the baking dish to ensure the seed bars are solid and not crumbly when they are cooked. Bake at 180C/350F for 15-20 minutes until baked and slightly crisp. Allow to cool. I managed to cut 22 seed bars. For the mixed seeds I used pumpkin and sunflower seeds. You may use any combination you like and can tolerate. Yes, you could cocoa, simply add to your liking (some prefer it more chocolatey than others), I would estimate 4 tbsp would do the trick. You will need to add more sweetener as cocoa powder by itself is quite bitter, and add some more liquid to counterbalance the addition of more dry ingredients. Another egg perhaps? These are all educated guesses. Come back and let me know how it went. I can’t get either cacao nibs or sugar free chocolate chips where I live. Is there a way to sub cocoa powder and coconut oil/butter? I love the idea of these. Does the chocolate help with binding, or can I just make them not chocolate? I purely like to add cacao nibs or chopped chocolate (I love 90% Lindt) as a noce touch and to help replicate the granola/muesli bars my children were once used to. You can easily play around with this recipe to add things you can buy in your area, and love. Why not some orange zest? Pecans? Walnuts? All yummy varieties. Can you use something else instead of flaxseed, chia or linseed to bind these bars together? I’m interested in making these so I was clicking your links for a few of the ingredients. However these links are constructed they don’t take me to the product so I can see the product info, it’s just directly to a page to add it to my cart. I’ve never seen that kind of link/page before. And it doesn’t have any way to get to the product info. I wanted you to know it’s not exactly a “friendly” kind of link. Apologies, the information should show when you hover over my Amazon links. Can you use sesame seeds? Or too high in carbs? I like the idea of chia, no grinding n less estrogen. How much chia did u use? Loved these Libby. Didn’t have flaxseed so added chia seeds, used the sunflower and pumpkin combo didn’t know if it would bind properly without ground flax so added a tablespoon of buckwheat flour. Would be more even more delish with a dob of melted dark chocolate or ganache on the top. Added macadamias to the mix(included in the seeds weigh in) for sweetness and delight. Used xylitol which leaves no taste I can tell, my go to sweetener now. Lovely!! These taste great! What kind of a shelf life do they have? I keep mine in an airtight container for up to 4 days. Or they can be frozen too. They are pretty sturdy so they would freeze well. Pop them in an airtight container with baking parchment in between each layer. Would this hold together with flax eggs or gelatin eggs?? We have multiple allergies including eggs here. I have never used flax eggs or gelatine eggs but would love to know. If you do try, please come back and let me know how they turned out. This would be a superb adaptation for those with egg allergies. So there is no sweetener of ANY TYPE in these bars? Are they supposed to be snacks or dessert? Do these have a lot of coconut taste? My daughter is not a fan of coconut unfortunately and so many low carb recipes seem to have it? They do, but it’s not overpowering due the the chocolate in there. You might want to add more vanilla or cinnamon to overpower the subtle coconut taste even further. I am new to baking with seeds. What seeds would you suggest? Wow we all loved these! Thanks so much for this great alternative to conventional muesli bars! I’m wondering would it work as a cheesecake base for one of your cheesecake recipes? Yes, that would be superb! can you use honey as sweetener?